Fall is an exciting time of year for hunters. It’s when loads of various hunting seasons begin and pretty much don’t stop until next summer (depending on what you like to hunt). But this probably isn’t anything you needed reminded of. Most hunters know this and are chomping at the bit for fall and all the (hunting) seasons it brings. If you do the type of hunting that requires a dog, now is a good time to think about that dog you’ll be taking with you. It’s important to make sure your dog is healthy and that its endurance is strong enough for those long treks and rough terrain. 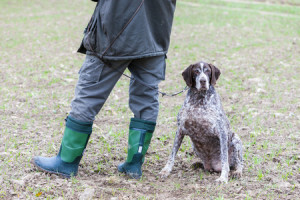 Maybe you’re planning on using your hound to pursue running game like foxes, coyotes and boar (and even deer in some case) or tree game like squirrels, raccoons, bobcats, mountain lions and bears. Or, perhaps you’re planning to use your “gun dogs” (aka pointers, flushers and retrievers) to locate hiding and/or camouflaged game like birds and fowl (and occasionally other small mammals like rabbits). Either way, you MUST makes sure your dog is prepared. Just like in humans, the best way to do this is with proper fuel and nutrition. Click here to to learn more about how to best feed your dog during the hunting season.